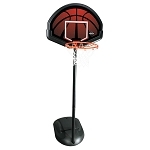 Get high-end features at an affordable price with the 71546 Lifetime portable basketball hoop. The backboard is made of polycarbonate, which is about 30 times stronger than a comparably-sized acrylic backboard. 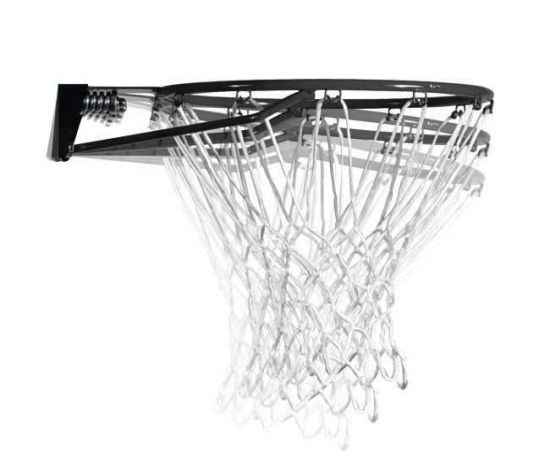 The backboard is framed in powder-coated steel, which provides a superior rebound than a plastic-framed backboard. 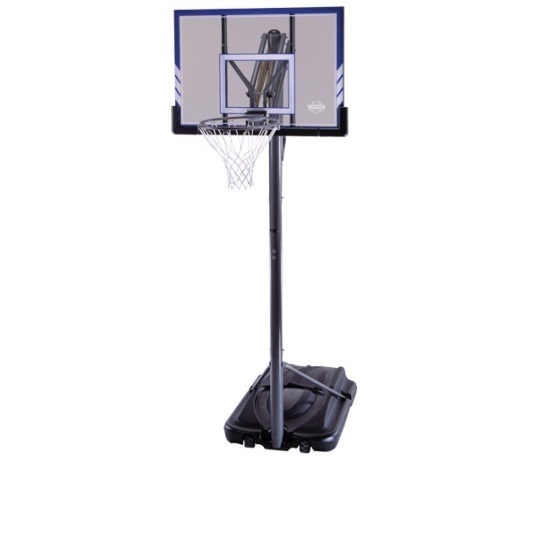 This basketball system comes with a large portable base that can be wheeled into position. 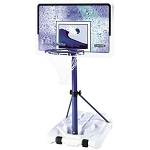 With a 35-gallon capacity, the base filled with water or sand provides ample support for aggressive basketball play. This system includes a 5-year factory warranty from Lifetime Products for United States and Canada customers. 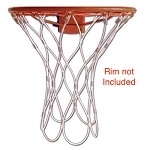 All steel components of this basketball system are powder coated to help the metal resist rusting. Lifetimes 44 inch Acrylic Backboard features a pro-glass look and provides superior performance. The steel frame gives added rigidity for improved rebound. The graphics are screen printed with ultraviolet protected inks offering fade resistant color. Dimensions: 44 inches W x 30 inches H.
Uses the Action Grip height adjuster. 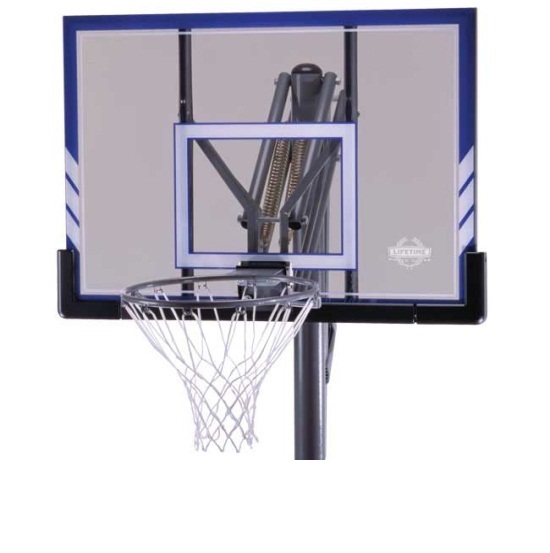 Action Grip adjuster uses a handle and counter balance springs to raise and lower the backboard height. 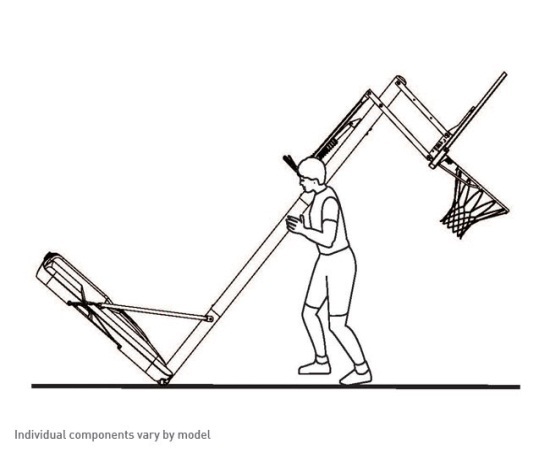 The height adjuster is activated by one hand and squeezing a trigger on a handle. Shipping dimensions: 50.3 inches x 34 inches x 10.75 inches. Arrived as promised. Great transaction! Reliable eBayer! SFSG 7 day delivery. Wont assemble until Christmas. Q: Can my child operate the Action Grip height adjuster? 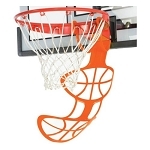 A: The Action Grip is operated using a single handle mounted to the back of the backboard. 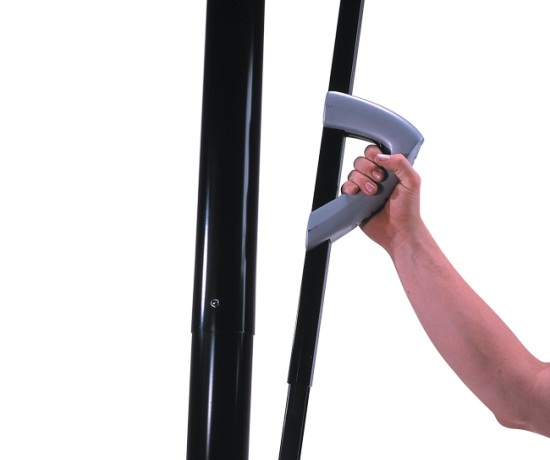 The handle is somewhat high off the ground, making tampering with height difficult for particularly young children and manageable for older children.